Shapes, colors, patterns, and people are everywhere, and things look different depending on how you look at them — and who is doing the looking. In this playful ode to photography and point of view, a poetic story posits how one young girl might capture moments of insight, community, and art in her beloved hometown, New York City. With the popularity of camera phones, photo-journaling, and photo-posting sites, this fictional exploration of photography as one young girl’s form of self-expression is guaranteed to appeal to budding photographers. It’s not what you look at, it’s what you see! 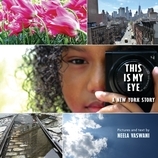 Take a journey through New York City as it might be seen by a child through a camera lens. 56 / 10 5/8" x 10 5/8"
Neela Vaswani is the co-author (with Silas House) of the middle-grade novel Same Sun Here and the author of You Have Given Me a Country and Where the Long Grass Bends. Her work has received an American Book Gold Award, an O. Henry Prize, and a ForeWord Reviews Book of the Year Award. A teacher at Spalding University’s MFA in Writing program and founder of the Storylines Project with the New York Public Library, Neela Vaswani lives in New York City.